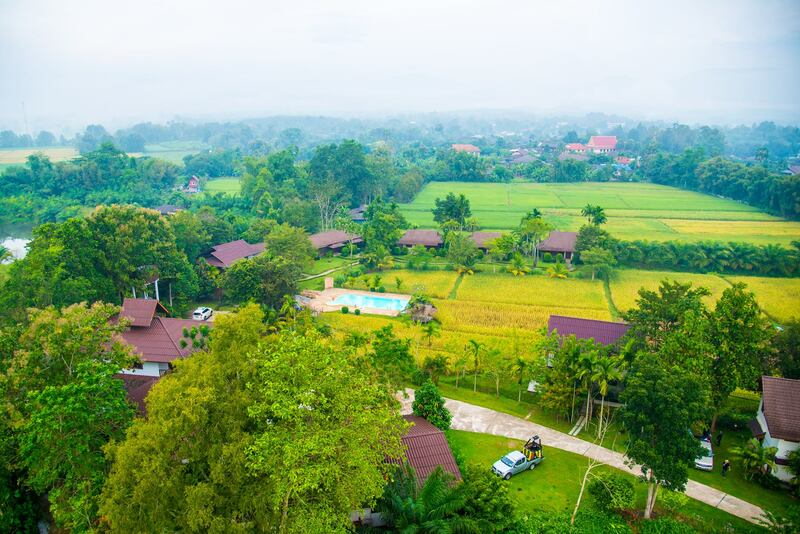 “The Chomna’s Story” The site of the Chomna resort was composed of the greenish-colored rice filed and the streams and the canals connecting into the river as the water network to help assist the farmers for cultivation of crops according to the seasons of the year. Both sides of the canal banks were full of trees, big and small trees, where living animals and birds dwelled their lives naturally amongst the trees which were full of fruits and flowers and their beauty was signified the symbol of the beginning of a new life. Each annual cycle of the community, the Chomna resort site would be full of water, and many flocks of birds and rice fields, and forests. The way of life of the people in the village would be called “TungnaNaban” or the front rice fields of the house. “TungnaNaban” was also known as the social stage where the life of the local people could be displayed in the forms of farmer’s occupation and the garden cultivators who would help each other as a social unit. The relationship occurred during the working sessions of the activities in the rice fields. In the past, the path towards Chiangrai Township was not developed. Thus, the traveling towards the hospital in town and the buying of goods along the way was difficult for it had to pass along the dirt roads through the rice fields, along the canal banks and the narrow paths in the rice fields. The goal was to get to the Phaholyothin road for getting on the transportation vehicles at the vicinity of Ban San Kam Pom (the Chiangrai natural park) and at another station called “Talad Rong khun” or Rong khun market(closely to the White temple or the other name “Rong Khun” temple). Currently, there was a good road cut through the village; therefore, the transportation was good and convenient and fast. Meanwhile, the rice fields became the back yard of every house. Thus, modernization seemed to reach the region very rapidly. However, the methodology of cultivation was still remaining the same for rice cultivation had been done in the ancient time still being practice at the present time. In short, the local knowledge and the local wisdom had been passed from generation to generation. In summary, the learning of the local authentic knowledge and wisdom was very difficult to find nowadays. Traveling and making journey through the villages was considered to be tourism industry for the fact that the Chomna resort was inspired to stand up amongst the natural resources and it became a natural resort for rest and relaxation, including the learning of the local history and the legendary chronicles. The guests could have an opportunity to meet local villagers as an authentic, true and genuine way of the people life in the natural atmospherics of the “Tungna Naban” also known as the front rice fields of the house for a touch of knowledge. We love to tell our successful far far away, behind the word mountains, far from the countries, there live the blind texts. The guests could have an opportunity to meet local villagers as an authentic, true and genuine way of the people life in the natural atmospherics of the “Tungna Naban” also known as the front rice fields of the house for a touch of knowledge.